Buzz Blog: Who is Enrico Fermi? For a long time, I didn't give Enrico Fermi too much thought. I knew he was a physicist, probably an important one, who lived during the first half of the 20th century and belonged to the honored group of people who pioneered many subjects in modern physics. When I finally read a physics history book that featured Fermi, I got a bit of a shock: the author painted Fermi in a rather negative light. He portrayed Fermi as an attention hog, a control freak, and kind of a poseur. The author suggested that Fermi wasn't a true creative genius like many of his contemporaries, such as Werner Heisenberg and Paul Dirac. This confused me because, if this portrayal was accurate, then why the heck did this guy have so many things named after him? And suddenly I felt a little embarrassed that I didn't know more about this man. In today's new podcast, I try to solve this little mystery. I can't say for sure that Fermi wasn't a control freak and an attention hog. But I think I can safely say he was an amazing physicist and in many ways, an amazing person. A former student of Fermi's described him as "the last universal physicist," by which he meant that Fermi knew a lot about all areas of physics. He made major contributions to quantum physics, nuclear physics, astrophysics, and many other subjects, in both experiment and theory. With the highly specialized fields we have today, it just doesn't seem possible to be a "universal physicist" any more. But what really struck me about Fermi was his teaching ability. 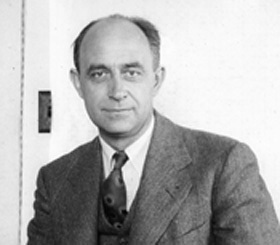 Fermi published many articles that drew together the complex ideas that were flooding out of the field. As a result, many young physicists learned a great deal from this man, even if they didn't know him personally. He was an excellent teacher, mentor and collaborator, and no less than 10 of his students went on to win Nobel Prizes. Fermi always demanded that people make their ideas clear. He was arguably one of the most well-informed physicists in the world, but he was never afraid to ask questions when he didn't understand something. Perhaps this is how he came to be a universal physicist. Guess better to make an opinion on Fermi from who personally met him, like Murray Gell-Mann, Richard Feynman, Emilio Segrè, Niels Bohr and so on...see for example the book "Fermi remembered" by James W. Cronin. What was the book you read that gave such a negative description of Fermi? Sort of unique amopng the vast literature on the man. My father learned the mechanics of running a nuclear reactor from Enrico Fermi. He used to tell stories about it. Fermi taught my father along with several other engineers from the Dupont company how to run the reactors built at Hanford Washington to make plutonium for the atom bomb. He talked about the reactors were to be run cold to maximize the neutron fluxdensity. It seems that a cold reactor propagates more neutrons than a hot one. They were in a hurry to make plutonium. He told me about how they pumped almost all the flow of the Columbia river thru the three reactors. In the process they raised the temperature of the river 6 degrees F.